I wrote last week about how I disagreed with one of the statements in an article written by Don Sakers in the April edition of Analog Science Fiction and Fact magazine. This week, I’d like to present something more from his article. “First, here’s the simple matter of availability. In the past, most books had a short shelf life. An average SF book would be on sale at general bookstores for a few months, a year at most, before it went out of print. If you’d just discovered an author and wanted to read all of their previous books, you’d be haunting used book stores. As a reader who still haunts used books stores trying to fill in gaps in my collection, I heartily agree with Mr. Sakers. This is one of the best things about ebooks. Because they do not take up valuable storage space in a warehouse while the paper gets damp and decays, they have a much longer shelf life. They can be stored indefinitely in a computer, and can stay in print as long as the publisher – or the author – choose to have them remain available. It becomes very easy to catch up with the older books you want to read. Keeping in mind that what Mr. Sakers says about SF books applies to all genres, he goes on to proclaim, “Nearly ninety years worth of SF books have been published; authors and their agents are working furiously to put much of that into e-book format.” I’d like to add my thanks to the families and estates of deceased authors who are allowing those works to be published in electronic formats. E-books are very convenient, as long as you keep them charged. You can carry a whole library around in your fingertips. They weigh very little. As the arthritis advances into my hands and wrists, I can no longer read any book that weighs more than a standard paperback while lying in bed at night. If I want to read a large paperback, or a hard cover book, I have to be sitting at a desk or table, and have the book on the table. I simply can’t hold that much weight in my hands. Yet, I’ve been reading huge collections on my Nook. The Mark Twain collection is over 6,000 pages, and the H. G. Wells collection is slightly thicker. I can read books only a few decades old, as well – because adding Diane Duane’s entire Young Wizards collection added no weight to my Nook. Overhead is significantly decreased on e-books as well, a point that Mr. Sakers does not address in his article. Although the author, editors, publishers, cover artists, and agent still must be paid, there are no storage fees. Amazon charges a shipping fee of around two cents per book to help cover bandwidth charges, and the book is delivered more or less instantly. That’s much less than the $6 super saver shipping that takes a week, on average, before the book is in your hands to read. 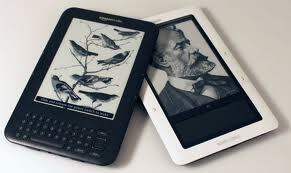 Because of these factors, e-books are usually less expensive than the print version of the same content. Don’t get me wrong. I love turning pages, and smelling the paper and glue scent of new books. I have more than 5,000 print books in my home and have no intention of stopping buying print books. But I also love holding my Nook in one hand while I read, and turning the page with a touch of my thumb. I love the ability to purchase eight to twelve e-books for the same $25 gift card that will get one or two print books. I love discovering new authors and catching up with old ones. And as an author, I love the ability to get my books into the hands of people who will love my characters as much as I do.